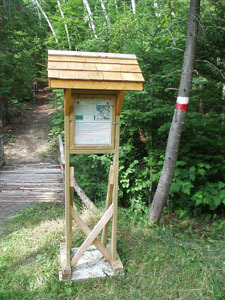 THE NATIONAL HIKING TRAIL IN THE BAS-SAINT-LAURENT IS THE REGION'S LONGEST NETWORK OF LINEAR HIKING TRAILS (144.4 KM), PASSING THROUGH TEN MUNICIPALITIES FROM TROIS-PISTOLES TO DEGELIS. THE TRAIL IS DIVIDED INTO TWELVE SEGMENTS, EACH EXTENDING FOR 8 TO 15 KILOMETRES. • Respect the fragile natural environment and wildlife along the trail. • Carry out your trash. • Help us keep the trail clean and safe. • Campfires are forbidden at all times throughout the trail system. • Stoves must be used for any cooking. • Stay on the trail and respect private property. • Camping is prohibited except in established campgrounds. • Be careful during hunting season. Be aware of the opening and closing dates. 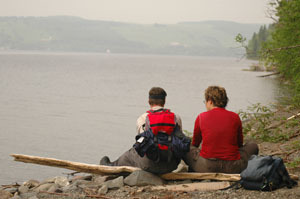 • Leashed dogs are allowed, except on trail sections on the lands of the Parc national du Lac-Témiscouata. • In case of emergency, dial 911 or *4141 (cell phones).